Wow! Now you don’t need a gender specific knee or have to worry about a company’s implants being the wrong size. With Conformis custom knee replacement technology, you will have a knee made exactly to fit your knee. A Cat Scan is done 4-6 weeks prior to your surgery and the anatomy of your knee will be replicated exactly and an implant made. 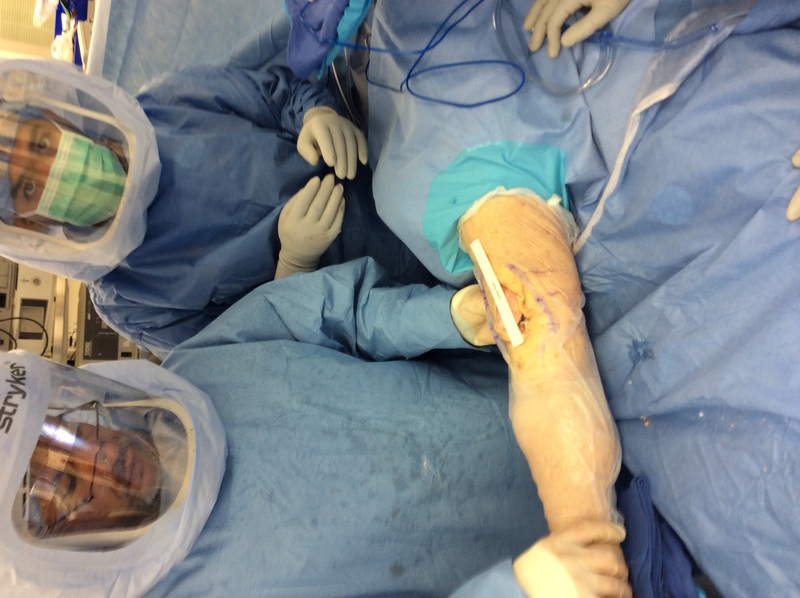 Patient’s with this type of implant feel like the knee is normal and not mechanical. Knee replacement surgery is very effective for knee with arthritis that are resistant to medications, injections and physical therapy. When knee replacement surgery is chosen, the ends of the bone are removed, both on the femur and the tibia and the patella. The ends are replaced with metal on the femur, plastic and metal on the tibia and plastic on the patella. Up till now the implants came in sizes. Dr Bennett has noted occassionally, the sizes dont completely conform to the patient’s anatomy. Now, a company Confromis uses a CT Scan to map your exact bone structure and they make an implant that is exactly constructed to your knee. Other companies use gudies that are specific to your knee. In addition, Bennett Orthopedics can perform a minimally invasive technique allowing you to walk without a cane in as little as 2 days post-opertaivley and usually all patients are off a cane in 2 weeks. Platelet rich plasma is also added, if desired, which accelerates healing and also greatly diminishes pain, and patients often only need tylenol at the 2nd post-operative day. 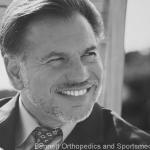 Photos Of Minimally Invasive Knee Replacement Surgery and Patients who have had one! The minimally invasive approach to Total Knee Replacement Surgery is defined as having a skin incision as 14 centimeters or less. 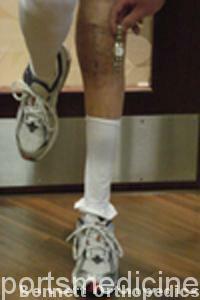 The standard approach to Total Knee Replacement may be twice as long or more. More importantly, however, the Quadriceps sparing approach is one which allows the implant to be placed in the knee without cutting into the quadriceps tendon allowing for early ambulation without cane, less blood loss, less pain and quicker recovery. Most of the benefits of this approach, as opposed to a standard approach, occur during surgery and in the early weeks and months following surgery. At 6 months this is no clinical difference, necessarily with the approach utilized. This approach requires an evolution by the surgeon to maximize outcomes; special courses and training and special instruments to place the components are needed and ordered for surgery, respectively. The actual implant is the same as would be in the “standard” approach. 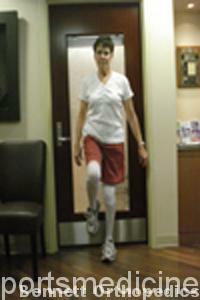 This patient had minimally invasive knee replacment and 2 week later was able to walk without a cane. 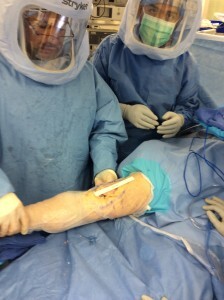 This photo shows the 4 inch incision and the preservation of the quadriceps tendon. Despite numerous setbacks following his minimally invasive knee replacement, this patient was able to walk without a cane in 2 weeks. 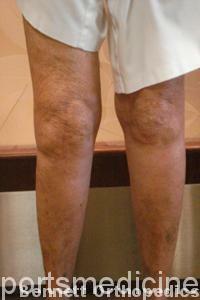 This patient had complete total knee replacement surgery 2 weeks earlier. 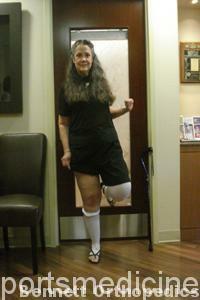 This is a photo of a minimally invasive total knee replacement patient who had surgery 4 months earlier. Most patients can walk without a cane in 2 weeks, many at one and two days post-operative, following minimally invasive knee replacment surgery with a small incision. 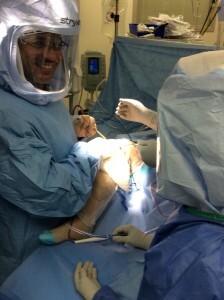 Small Incision knee replacement allows early indepence. 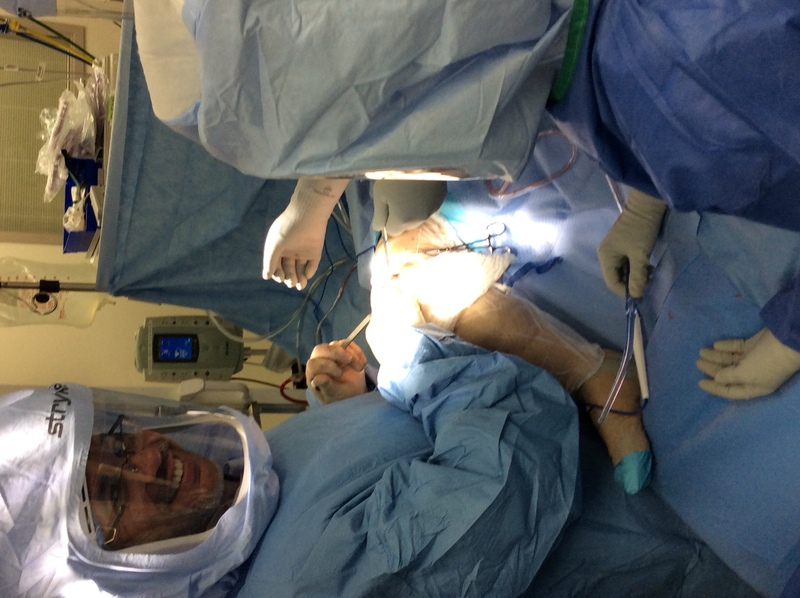 Minimally Invasive Knee Replacement, Walking Already!